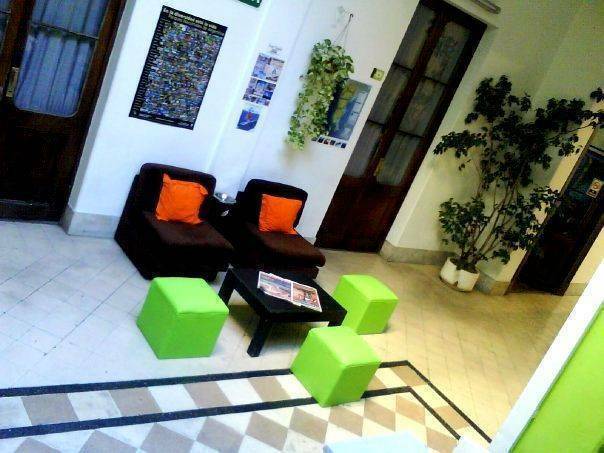 Located in the downtown of Buenos Aires, only 300 metres from the Obelisk. Just 50 metres from subways and bus stations (Corrientes Avenues), 100 metres from Florida St. We are really close to Corrientes Avenue, to The Opera House, Colon Theatre, bookstores and many cafés. Set in a refurbished house which preserves its Spanish style, the high-ceiling rooms are spacious and well lit, and they are provided with heating and air conditioning. Safety in the neighborhood is excellent during the day and night. 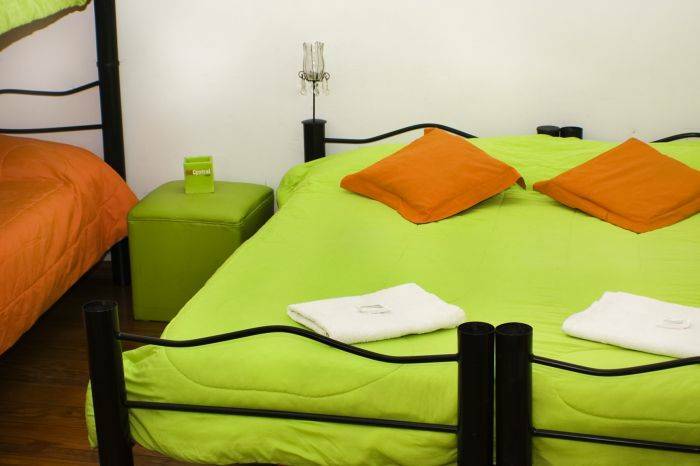 ROOMS 06 CENTRAL HOSTEL HAS SHARED ROOMS, PRIVATE ROOMS AND SUITES. The Shared rooms can sleep up to 6, 8, and 10 people, and have individual lockers, heating and fans. The Private rooms for 2, 3 and 4 people have individual lockers, heating and fans. The Double and Quad Suites have a private bathroom in suite, air conditioning and heating. KITCHEN The kitchen is fully equipped with full cutlery, refrigerator, electric ovens and microwave so that you can cook as if you were at home 24 hours a day. DINING PLACE The hostel has a really comfortable place to have your meals and enjoy a drink with friends. Newly-recycled BATHROOMS AND SHOWERS 06 Central Hostel has fully recycled facilities, designed to offer comfortable services such as hot water 24 hours a day, electric hand dryer, large mirrors and personal hygiene amenities, among others. OPEN YARDS One of our yards is open in summer and closed in winter. Both are ideal to enjoy yourself with friends, use laptops, relax and enjoy the sunlight or a starry night. TV / DVD / INTERNET ROOM with games and books The Hostel has a specially designed and equipped room to relax while watching TV or DVDs, read and make new friends. You can also have video conferences here. Newly-recycled BATHROOMS AND SHOWERS 06 Central Hostel has fully recycled facilities, designed to offer comfortable services such as hot water 24 hours a day, electric hand dryer, large mirrors and personal hygiene amenities, among others. TV / DVD / INTERNET ROOM with games and books The Hostel provides Free Wi-Fi access 24 hr. We have a specially designed and equipped room to relax while watching TV or DVDs, read and make new friends. You can also have video conferences here. 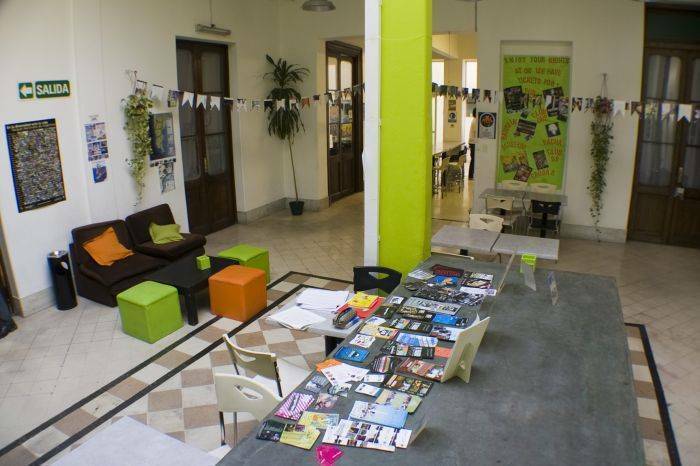 06 Central Hostel is the first Design Hostel in Buenos Aires. 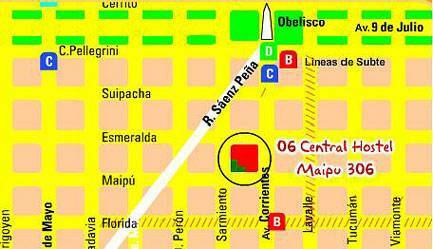 We are located in the down town area, within walking distance from the pedestrianised streets: Florida and Lavalle, and the widest avenue in the world, 9 de Julio Ave.
Best Hostel - Right here ! Nearest airport: 20 minutes by car from Ministro Pistarini International Airport.